In the course of many years travel across Tuscany, I have created a list of my favorite places to enjoy lunch or dinner. This particular short list focuses on the areas in, or near, San Gimignano, Monteriggione and Barberino Val d’Elsa. Great food, fair prices and consistently good service? Try these if/when you go. Meals enjoyed at these restaurants have always been memorable. This Ristorante is located in the Hotel La Cisterna, on the Piazza of the same name, in the heart of San Gimignano. Llarge sliding glass windows face the valleys below San Gimignano. For lunch, especially, this is a wonderful place to eat. The food is fairly priced, traditional and the wine list pricing is fair for a city so full of visitors. I recommend calling to reserve at table prior to your visit. 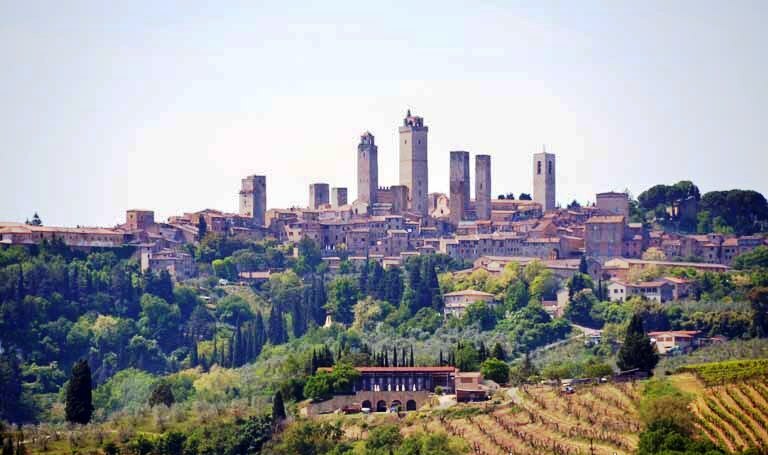 You can also, on the day you arrive in San Gimignano, walk to the hotel and reserve a table for your lunch or dinner. Lunch begins at 12:30PM, dinner at 7:30PM. When the Slow Food Movement began in Italy, Dorando was one of the first restaurants to deliver on the goal of incredible food, great wine list and time to enjoy the meal. 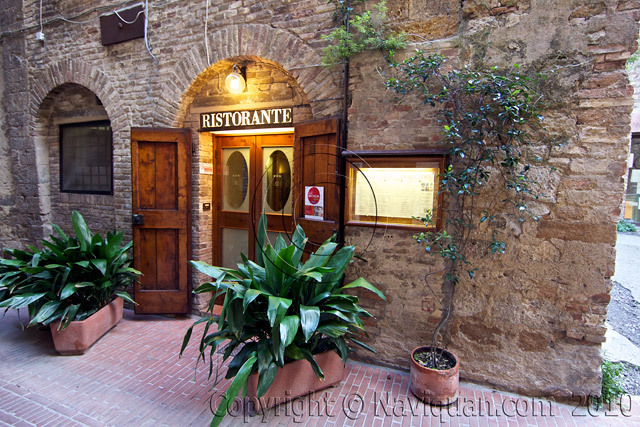 The restaurant is located down a narrow alley, directly off of the Piazza Duomo in San Gimignano. 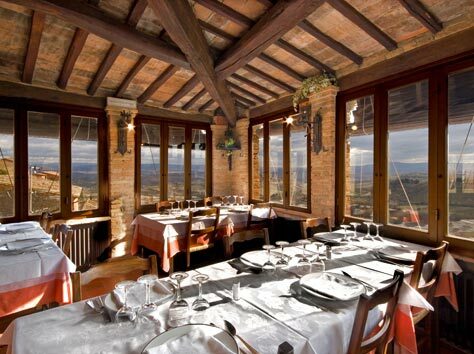 There are no views, as the restaurant is located in the cellars of a 14th Century building. Lovingly and beautifully restored, you will not miss the view – the food and wine are the focus in this fabulous restaurant. This is not an inexpensive place – and you should plan at least two hours for a meal, especially dinner. Reservations strongly recommended. Just inside the Porta San Giovanni, the main gate of the town of San Gimignano, is the Hotel Bel Soggiorno. Unbeknow nst to many visitors, the hotel offers one of the finest restaurants, with some of the most gorgeous views, in Tuscany. This is also a lovely hotel, providing clean and comfortable, though not particularly large, rooms. There are a few rooms available that have large terraces. The views across central Tuscany are unforgettable. The restaurant is located off of the lobby at street level. As you enter the space, the entire valley below San Gimignano spreads before you through huge glass windows. Great place for lunch or dinner. I do highly recommend reservations if you plan dinner. Some Florentine friends introduced me to this restaurant five years ago and I’ve returned many times. The local Florentine beef is outstanding – some of the best in Italy. The wine list is certainly sufficient and the prices are very fair. The view of the towers in San Gimignano from the terrace is one in a million. I can’t recommend this place highly enough for both lunch and dinner. It is the unique combination of perfectly prepared meals, the view and the loving care that the owners give to their farm, that makes this place very special. Please note: The Poggio (small hill) is located outside the San Gimignano city gate of San Matteo. You will find the Poggio on your right as you drive down away from the Porta (Gate) San Matteo. The sign for the place is not very easy to spot…but just keep looking to your right as you drive away from San Gimignano. If you drive more than ten minutes or so, you have missed the turn into the Poggio. Well worth the effort! 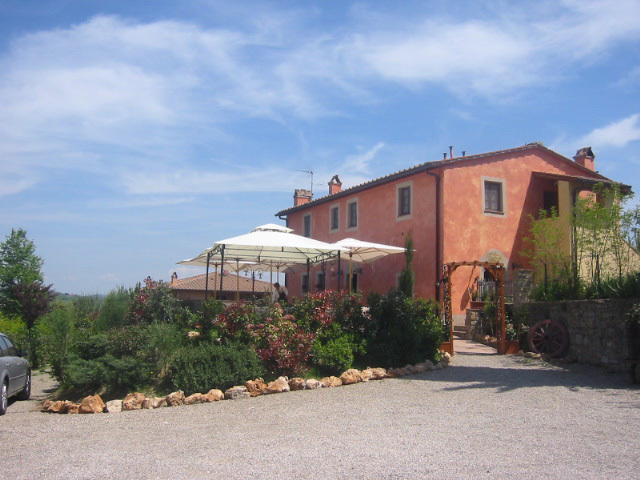 This is an Agriturismo, so you will find vacation apartments and a gift shop along with the restaurant. 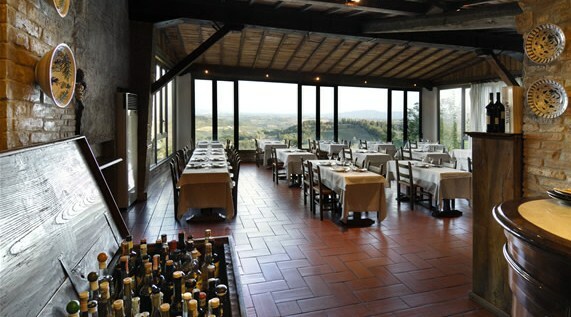 A wonderful place to enjoy a shaded lunch or dinner with spectacular views of San Gimignano. The village of Monteriggione is located within sight of the Florence-Siena motorway, but you will hardly notice that proximity. This is a true medieval walled town that has little changed since it was built by the Sienese centuries ago. 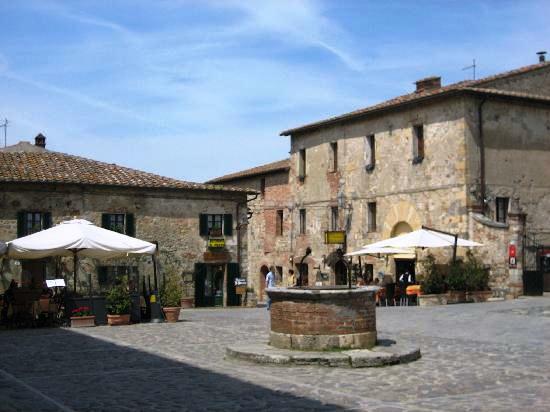 There is one small piazza and Il Pozzo is located directly on that square. Tables on the terrace offer umbrellas for shade and lunch or dinner at this restaurant is – for good reasons – memorable. If you wish to eat on the terrace, come early. Lunch begins at 12:30PM. A family run, small, restaurant near Barberino Val d”Elsa. Excellent meals, lunch or dinner. Highly recommend especially if you are driving in the area for a day’s exploration. Well worth the stop for a lovely lunch in this area of Tuscany. The food is incredible and there are few places out in the country that offer the tranquil shade of a terrace with memorable views. Enjoy a flavorful meal at this lovely restaurant.